Write a story about what happened when the pigs flew into town on the following Tuesday. Think carefully about what your story will be about. Here are some plot ideas for you to use if you are stuck. 3. Maybe they are looking for a new place to live? When I woke up i see i was flying in the sky then i said my baBies and the other pigs was sleeping and i didn't no what to do i woke up in the night and i was shaked. The pigs were sleeping and flying because they stole the frogs lily pads when they opened there eye then opened they were suprised because they were flying in the air. The pigs had a party in the park. The pigs went to the shop to buy cloths for the party and they bout food.The pigs were dancing in the middle of no were.The light switched on . And the light turned of again. The pigs were frightened because that place was haunted the pigs began to cry they tried to call there mothers on the phone but they did answer the call on the phone. After the pigs went into the market and they saw backon so they screamed. Then they saw some flower then they put there heads in the flower. They was bumping into things then eating things so they went near the freezer to see some ice cream and there was it was strawberry ice cream.But they axedently fell into the freezer and there heads were stuck in the freezer with ice cream on there heads. The pigs went to a supermarket they crashed in the supermarket with a bang but everybody that would come had not came yet because no one was up yet they were asleep but the supermarket guard just came then they hided in a junk of food and got food for the party and lots of other different food then he went to the closes shop by flying in the sky crash crash they crashed in the shop no one was there maybe there having a nother party with every thing they got in there house the pig just got every thing he could get in the closes shop and then went to the party with flying in the air and got there and this time he dident crash then they ate cake sweet and dressed as silly humans and they had lots of fun. The pigs thought of a solution for what they would do today.They thought they should go to the supermarket,And by some food for them to eat.One pig opened a freezer.And he got stuck on ice cream.The pig saw something interesting so he walked up and saw bacon and they all screamed.The other pig saw a delicious chocolate ice cream and the pig thought it was mud ice cream,so he got it.As soon as they finished shopping they all went back to the barn floating.After they thought of another good solution to make the worlds biggest party ever.So they went to buy trumpets flutes and other musical stuff.Then they went to the supermarket again to by cakes and cupcakes and juice. After they stetted up some properties that would be used for a party.Then that day there was a thousands of people having conversations about what there gonna do.After that day they had the joy of there life. The creatures was sneaking around and they opened up one eye slowly and saw that there were junc like old cheres and rust pictures with dust in and photos that was from 111 all of the pigs opened the 2 eye and was climeing over the wall they was calling for 50 busts and on the way there were lots of cloths so the pigs arrived so they tuck the cloths and got out the bus so they wen to the supermarket and they was ham so they said uh and got on a trole so they bumped into the fridge and lifted the fridge and saw that there was ice cream so they licked it and got there head stuck so they bashed there heads together and ran to the toys to play but the pigs broke them by sitting on them so they was drinking somethinglike juice and eating grass so they went to the party and there was a birthday cake so they eat everyone cake they went into the garden to eat grass and they made a big mess all over the floor. The horrifying creatures found themselves to a barn They liked the look of it.So they went into it and saw some clothes.They went to put on the clothes then wanted to go back outside to get new clothes to see their grandma and on the way there they saw some food that they wanted to eat and they had fun eating.They saw frogs so they went to the frogs and had a chat they wanted to cause a havoc so they did and they had fun. The pigs need to escape the freezing cold pond. To go to the supermarket in the city so they can find something to eat. Once they arrived there it was locked the window was open there went inside. All the shelfs was packed with great things. They were eating for so long they fell asleep once they woke up all the customers was staring at them they were trapped. they are having a party they need to by some in interments for the party.In the supermarket there is no food and we need to by food for the party. We need a lot if we dont have food we wont eat and we need clothes. Which tipe of clothe human clothe and we need fireworks. For the party and i deferent plse like a park which park won that you or me have never been before. They zoomed to the supermarket at blazed speed on pis fell into a tub of grass flavored ice scream they smelt with there snouts grass then the sore bacon and other cooked pigs then they sneaked in to a shop with human clothes then they saw an interaction to a party for humans the pigs had never went to a party or town. So they dressed up like human with guitars trombones and a drum then the went. To the party later on when they got there the pigs relisted that there was grass everywhere. They couldn't resist grass and they ate it and blew there cover. 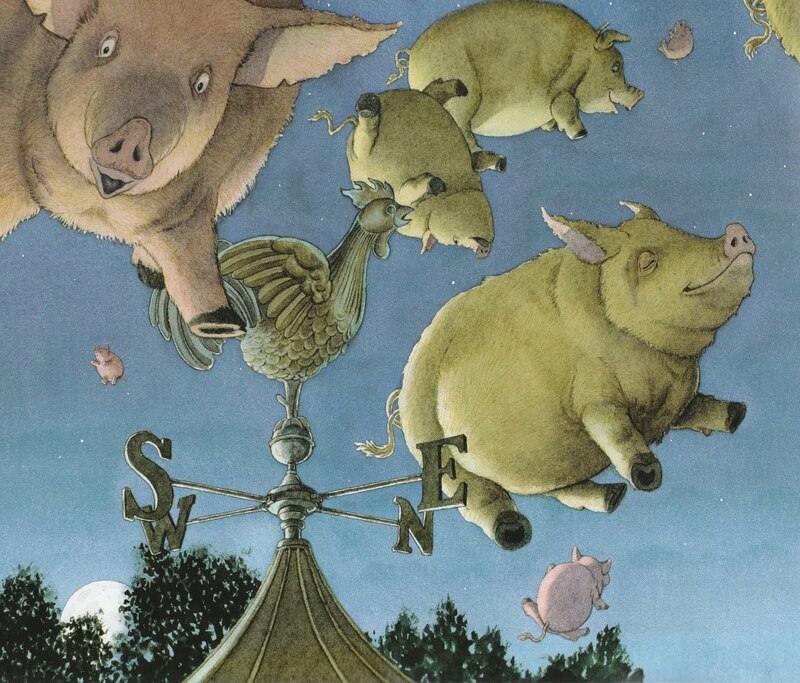 Then they all shouted pigs they quickly glided away then they noticed that the pigs hover away so they wondered if it was a dream because flying pigs i sent real are they they wondered then the people told the news but they never believed then even if 100 people told the news.